Sir – A tribunal of international legal experts has delivered a scathing report on fracking, arguing the unconventional gas and oil drilling method is a human rights violation. The Permanent Peoples’ Tribunal (PPT) has handed down its final report on its Session on Human Rights, Fracking and Climate Change, calling for a worldwide ban on fracking, and encouraging support for people’s movements against the controversial drilling technique. The report makes several recommendations for local, state, national and UN action, including that nations recognise the rights of nature in a similar way to human rights to help address the existential threat of climate change. It also calls for the UN Special Rapporteur on Human Rights and the Environment to be asked to investigate the violations of the rights of humans and nature by the unconventional oil and gas extraction (UOGE) industry. We plan to use the document to pressure the Queensland and Federal governments. The Queensland Government has just recklessly approved the Arrow energy CSG expansion on the Western Downs, despite what we know about the unconventional gas industry. We know CSG on the Western Downs has dewatered farmers’ bores, it’s led to a massive decline in agriculture, and has not supplied anywhere near the number of permanent jobs first touted by the industry. There are also ongoing concerns about health impacts on people who are forced to live near this invasive, polluting industry. As well, the gas industry is a major source of greenhouse gas emissions due to the production and transport processes, and due to gas leaks from wells and pipelines. Convenor of the Australian PPT sessions and impacted Chinchilla resident. 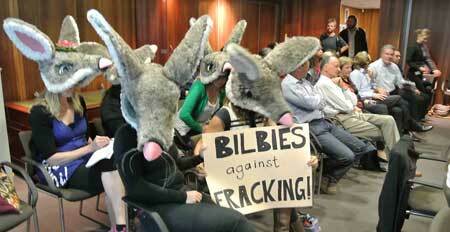 Photo: Protesters in the Alice Springs Town Council gallery in 2014. Footnote: The Permanent Peoples’ Tribunal (PPT) was formally born in Bologna in 1979 as a direct continuation of the experience of the Russell Tribunal II with Latin American dictatorships (1974-1976). The PPT was promoted by Italian Senator Lelio Basso to denounce the crimes committed by the military regimes of the region. The will of the people and the victims of Latin America changed the occasional nature of Russell Court and it became a permanent forum of complaint for communities experiencing the absence and impotence of international law. Therefore, the PPT is a grass-root initiative and the result of the need to create an independent tool for researching and analysing for the cognitive, cultural and doctrinal development needed to start the process of liberation and justice of the people. The work of the PPT is based on the principles expressed in the Universal Declaration of the Rights of Peoples proclaimed in Algiers in 1976 and the main international instruments protecting human rights. The potential for major errors and a lack of transparency have been uncovered during an analysis of fracking company Santos’ application for a water licence in the Northern Territory. The NT Government has invited public comment on the Santos water extraction application, yet the details of the volume of water requested appear to be incorrect and the sustainable yield figures significantly overestimated. Santos’s own drilling logs also contradict the public application notice, showing a different aquifer would be the actual target for water extraction. Information from the NT Government reveals the volume of the advertised target aquifer, the Gum Ridge Formation, may have been overestimated. It appears an extra zero was added by the department. The department [is standing] by their figures yet refused to justify them at this point, saying only that it would review submissions upon closure of the comment period. You can either run around claiming the sky is falling in or learn how the onshore gas industry operates, how it’s regulated and how it can complement existing agricultural businesses.